Worship Trains : Reform worship. 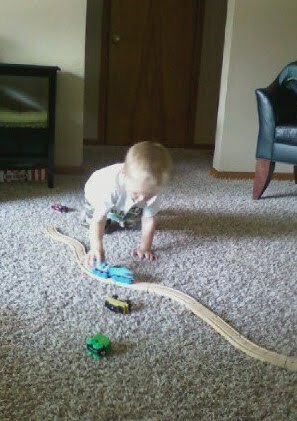 My son loves choo-choo trains. We live a block away from some busy freight tracks. It's a "no horn" town, but occasionally a train blows it. And when it does, no matter how faint the sound, my son's magic ears pick it up, thanks to the tubes. He jolts to attention with a gasp, locates the eyes of either mommy or daddy, and squeaks, "CHOO-choo!" Then, temporarily abandoning his Thomas wooden starter kit or his Thomas DVD he runs to the bay window in his Thomas PJs. Sometimes I think he has magic eyes, too, x-raying our neighborhood, dense with old maples and even older homes, to see the trains go by. You can't see the trains from our house. Only he can. Choo-choo trains have ka-chugged deep into my son's heart and imagination. The Sunday worship gathering shall be part of life rhythm. Liturgy is rhythm. What you do together is what you do in the rest of your life. Everybody has a liturgy, a rhythm to what they do on Sunday morning. It should be no different than what Christians do in their everyday lives. He then breaks down what a typical Sunday worship gathering looks like at Life on the Vine, the church he co-pastors, and goes on to talk about how "every element trains you to do everyday activity in your life." Gathering trains us to be physically present in the lives of each other. The Practice of the Peace trains us to share the peace of Christ with everyone in our life. Silence trains us to make space to hear from God in our life. The Sending of Children trains us to send out our kids with a blessing. Readings train us to submit to Scripture every day -- to listen, submit, and see our world through Scripture. Art trains us to find the beauty of the Lord in all of creation. Confession trains us to confess our sins one to another everyday. Creeds train us to pledge our allegiance to Jesus Christ and to no other worldly person or power. The Lord's Prayer trains us to pray like Jesus taught us to pray. The Proclamation of the Word trains us to submit to the declared reality of Jesus as Lord of our life. Prayers train us to intercede and to uphold one another in prayer throughout our days. Eucharist trains us to give thanks and fellowship with one another at every meal and other mundane activities. Songs of thanksgiving and praise train us to constantly give thanks and praise to God throughout our days. Benediction trains us to receive the blessing of Christ and to bless others in our life. Why is it so profound to me? Why did I care to bullet point every single one of these worship elements? Maybe it's because I'm struck by how every single one of them touches a part of my everyday life, at least the worthwhile things I spend my time doing. These elements of gathered worship really aren't all that different from normal, everyday life activities, are they? Worship is a formative encounter, or worship that shapes a people into life with God and mission. Worship is spiritual formation. We are coming together to encounter his presence, to be shaped into his life, to submit to this, and to be sent out...Worship teaches us how to respond to what God is saying/doing in our life. What do you think? Does worship train? If we approached worship in this way, what might we change about our worship gatherings and the kinds of activities we lead our people in? You got no comments on this post, but don't worry. It was helpful. Our crew reviewed this post this past Sunday and specifically the things the worhsiip service trains people to do. Great post - thanks. If it isn't doing that forming and shaping, it may not really be worship and the "church" may need to be renamed to just a social center.